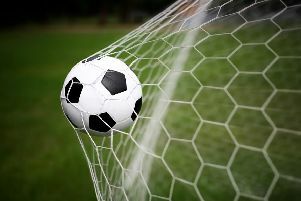 Westfield Football Club finally kept its first clean sheet of the season and ended a six-match winless run on Saturday. A first half goal from Gordon Cuddington was enough to give the Westies a 1-0 victory at Steyning Town and move above their opponents to 11th in Macron Store Sussex County Football League Division Two. Westfield manager Jethro Warren said: “I was made up with it. The pitch was awful - it was like playing on concrete - and it wasn’t a pretty game of football, but we played the conditions very well and got the three points. Neither goalkeeper had a great deal to do, although Westfield had most of the few chances which were carved out at either end. With the ball bouncing around all over the place, making possession football very difficult, set-pieces offered one of the best routes to goal, and Tom Archer and Matt Dadswell had opportunities from dead ball situations. But it was a goalkeeping mistake which led to the only goal just before the half-hour. A Steyning defender played the ball back to his goalkeeper, who knocked it round a Westfield attacker, but his touch was too heavy and Cuddington slid in with him before turning it home. Steyning’s corner count went into double figures, and they looked dangerous, but Westfield centre-halves Archer and Sam Henham dealt with them well. Henham, in fact, did a very good job of marking Steyning’s big and strong centre-forward out of the game. Possessing a couple of dangerous wide players, Steyning were pretty good going forward and they mounted a bit of pressure during the final 10 minutes, but Westfield held on for their third away league win of the season. Warren felt that the flow of a niggly game wasn’t helped by a “poor” referee awarding free kicks both ways when he shouldn’t have done and not giving them when he should have. Westfield: Holland; Paine, Archer, Henham, Bell; Warren, Brand; Williams, Cuddington, Burton; Dadswell.